Harlem Flop House – The things you can learn from a French woman! Three years ago actor, dancer, playwright and theatre director René Calvo spent the day preparing his Manhattan apartment for the visit of Cecile, his French girlfriend. He cleaned furiously, arranged flowers, stacked her favourite CDs by the stereo and researched where to buy the best croissants in the neighbourhood. Cecile appeared and after passionate hellos, the conversation turned to plans for her stay. Calvo enthused about famous sites, the city’s shopping highlights, plays and concerts, museum treasures and places to go roller blading. Unimpressed, Cecile revealed her desires: “René, only two things I want to do. Be with you and go to a church that has great gospel music – in Harlem”. Calvo wondered if Cecile realised why the tone of his voice rose so sharply on the final syllable of Harlem. Even in low-crime-rate New York, residents carry a mental map of the city. On the map are borders, crossing them means looking for trouble. To many people, Harlem has the most forbidding borders in town. Cecile’s reply was concise and definite. “Yes, René I want to go to Harlem”. While Cecile slept off her jet lag, Calvo studied the yellow pages. He phoned churches in Harlem but no one answered. He called his friends. He went for a walk and asked his neighbours about Harlem. The usual response; “You’re crazy, what do you want to go there for”? Calvo returned home, showed Cecile the addresses of churches in the phone book and said; “If we go on Sunday morning it should be okay, but I’m still not sure”. Cecile’s eyes filled with Gaullic disbelief. “René, we do not need your yellow pages, it is all here in my guidebook”. Using his journeyman’s French, Calvo worked his way through the guidebook’s Harlem section. It listed 15 Churches offering gospel music every Sunday. Names of ministers, hours of services and how to reach each church by subway, bus and taxi – as Cecile said, it was all there. There was more. After the First World War, Afro-American soldiers returned to Harlem and regaled their compatriots with accounts of a prejudice free life in France. Dozens of jazz musicians, writers and dancers swapped the Hudson for the Seine. The places these artists left behind, and returned to when WWII began – the bars, night clubs, theatres and dance halls of Harlem – were reverently recommend to French tourists. On Sunday morning the couple subwayed uptown for the eleven o’clock service at Harlem’s most famous church, Abyssinian Baptist on West 138 Street. Calvo was ready for the powerful beauty of the choir’s singing and for the elegant way the congregation dressed. But he was not ready for the three hundred tourists waiting to enter the church, French, Dutch, Italian, German, Spanish and Scandinavians. Harlem was on the tourist map for Europeans yet people who lived in the city never went there. As New Yorkers say when they wish to express bewilderment, “Go figure”. Born into the only Puerto Rican family in bucolic Chelmsford, Massachusetts in 1958 René Calvo always knew he wanted a theatrical career. In 1980 he earned a Fine Arts degree from Boston University. His first play The Iron Horse was staged by a local theatre company in 1984. Moving to New York in 1986, he supported himself first as a waiter and then as a freelance graphic artist. Calvo’s time living in one of Manhattan’s most notorious ‘welfare hotels’ – home to winos, drug addicts, destitute street people and several struggling writers – provided raw material for his second play and first off-Broadway success; House of Hell. In 1992 the New York City property market crashed. Recently renovated apartments in unfashionable parts of town were repossessed and sold at bargain prices. Calvo bought his first property, a 325-sqft East village studio, for $12,000. Becoming a property owner coincided with his next theatrical venture and second off-Broadway success, Ailanthus Grove, – every performance told a different story about a small American town and its inhabitants. Attracted by the challenge of creating ‘on-stage soap opera’ many of New York’s rising playwrights and actors agreed to collaborate on the project. When it closed, Calvo wrote his next off-Broadway winner, Spyz, about a CIA agent who yearns to be a professional Salsa dancer. About this time that Cecile arrived. Seeing the queues of tourists outside Abysseinian Baptist Calvo wondered if they would stay in Harlem as well. 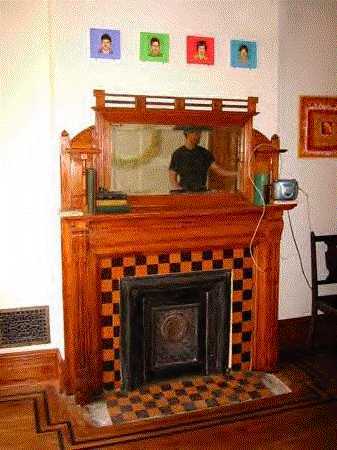 Maybe what Harlem lacked was a stylish B&B? Calvo began his hunt for a suitable building. He hunted until his feet turned into bloody stumps. When he saw the building that would become the Flophouse the asking price was $425,000. He offered $350,000. The owners, married music professors about to retire to California, refused. At Christmas time the couple’s broker (estate agent) phoned Calvo. She said; “The market is softening, my clients are worried it won’t revive in January, they’ll take your offer”. Walking into a lawyer’s office to sign contracts Calvo confronted the inharmonious sight of two crying music professors and demanding more money. Heavy haggling followed but the price stayed the same. While Calvo waited for his mortgage loan to clear the couple’s broker phoned again. “Deal’s off” she said, “the woman’s mother died”. Expressing his sympathies, Calvo asked where to send flowers. Silence, then the broker said; “I’ll get back to you on that”. Calvo soon heard that the woman’s mother was alive but ill. The couple stuck to their side of the bargain but only when Calvo’s lawyer applied intense legal pressure. After selling his East Village apartment Calvo bought, lived in and sold other properties, always turning a profit. These were cash deals, no mortgage needed. He needed one now and wondered if any bank would loan him money, after all, he never had a full time job. Because buyers in New York City rarely deal directly with the bank, Calvo went to see the other type of broker involved in residential property transactions, the mortgage broker. The broker was optimistic. Calvo had a sizeable chunk of cash from the sale of his last property, he wasn’t asking for a huge loan and the bank would consider the money from room rentals as income. His application was quickly approved. It was now February, he expected to be in his new house by May. Having sold the apartment he was living in, Calvo moved in with a friend, certain he wouldn’t be there long. He wasn’t, the same was true of the next friend he stayed with and the next. Schlepping his suitcase, guitar, roller blades, cell phone and a backpack filled with documents related to the deal from friend’s apartment to friend’s apartment he wasn’t anywhere for long. By July, worried his application had fallen into a home financing Marianas Trench, Calvo by-passed the broker and contact the bank himself. When he finally reached the officer responsible for the loan he realised she thought he was the mortgage broker. Calvo decided to gamble. He identified himself and asked if the bank engaged in the illegal practice of ‘redlining’ – refusing to lend money to people who want to buy homes in neighbourhoods which are perceived to be poor and dangerous. In a shaky voice the loan officer answered; “There is no reason to get upset, I’m sure we can work something out”. Before long, Calvo had his money. Now, he could create The Harlem Flophouse. 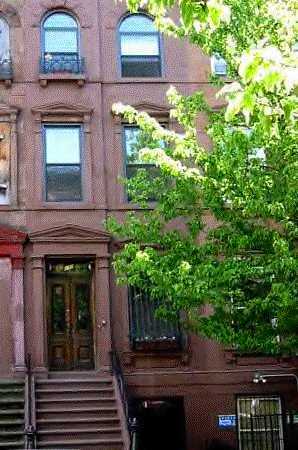 From the outside the house looked like what it was meant to be, a jewel of a late 19th century New York brownstone. From the inside it looked like what it had become, cheap accommodation for students. The house measures 3,500-sqft, evenly spread over four floors. The music professors kept one floor for themselves and divided the rest into ten bedrooms, three bathrooms, a kitchen and two storage closets. Calvo knocked down the dividing walls and returned the building to its original configuration of two bedrooms and one bathroom on the top two floors, and a spacious kitchen and parlour on the first floor. Calvo lives in the basement flat. His cat Calliope wanders where it pleases. He describes restoring the building as easy, hard, intriguing, satisfying, backbreaking and hair-raising. Knocking down the walls was the easy part. The hard part was rescuing a builder who fell through a rotten ceiling and was buried under three feet of debris. The intriguing part was finding the elaborate 1890’s maplewood skirting board. An Internet search located a mill 1,500 miles away in Illinois. Calvo sawed off an ‘end-profile’ and sent it to Illinois. Two weeks later FedEx delivered the new skirting board. The satisfying part was ignoring ‘expert advice’ that the distinctive tin plate ceilings being irreplaceable. A stencil of the plate’s pattern was emailed to a company in Brooklyn, it turned out to be the company that fashioned the original ceiling. They pressed what Calvo required and sent it over. Ripping up old carpets, linoleum and rotten plywood floors and replacing them with separate oak planks was the backbreaking part. The hair-raising part concerned mysterious metal panels covering small recesses in two of the bedrooms. Calvo yanked one away and was covered by what looked like black snowflakes – the remains of thousands of dead cockroaches. Calvo never intended to do a completely faithful restoration. “I didn’t want to erase all the history of the place. You can still see cigarette burns on the mantle pieces and you can see where people screwed hooks or banged nails into walls. I wanted all that history to stay but I still wanted a beautiful place. I wanted to find a new expression for the house. For me that’s a question of knowing when to stop”. The four bedrooms are bright and airy, as in the original ‘expression’ of the house. Each has it’s own sink surrounded by large wooden cupboards perfect for hanging clothes. High ceilings let the hot air rise, so air-conditioning is unnecessary. The bathrooms are located down the hall form the bedrooms. The halls are narrow and windowless because in the 1890’s architects were eager to show off the amount light generated by a new technology – gas. Rooms don’t have telephones, (no need when so many people have a mobile) or TV’s but more thought provoking entertainment is provided. For a few months a composer working on a film score rented a room. In the evenings he tested what he had written with a quartet of musicians in the parlour. Occasionally, photographers turn the Flophouse into a fashion shoot venue. Most of the time the place is filled with the sounds of WKCR from nearby Columbia University. The station features a jazz programme hosted by New York legend Phil Schapp. The show is heard on the excellent sound system in the parlour and on the vintage American radios in every bedroom. Calvo regularly uses the parlour to practice with the other students in his Salsa dancing class. The flophouse has two art exhibitions every year. The art is hung in the parlour, the bedrooms and the kitchen. During an exhibition opening, six guests, Swedish female Salsa dancers prepared for a night out a New York’s Latin dancing clubs, while 350 people swarmed around looking at painting of women, by women. Calvo says it’s the sort of atmosphere he wants. Oh well, that’s what happens when you learn something from a French woman.